Give your furniture new life and a new look with a fresh coat of paint. Whether you want to paint a chair, table, nightstand, or specialty piece, this is a great DIY project that can give your furniture a unique look with just a few hours of work and some basic supplies. You have many options when painting your furniture. The type of paint is the biggest consideration you’ll have to make, since there are oil, latex and acrylic paint options for furniture, along with specialty paints like chalk paint and milk paint. Each of these paints for furniture carries unique advantages, and some are better suited for one type of project versus another. By the end of this article, you’ll have a better understanding of which type of paint is best for furniture projects you have in mind. So read on to learn about choosing one paint over another and what the pros and cons are that you’ll need to consider. Latex paint for furniture is a popular option since it’s easily accessible and available in nearly every color under the rainbow. You can pick up a pint or gallon of latex paint at your local hardware store and choose from a variety of different brands and finishes. There are also low or no-VOC (volatile organic compound) formulas, which are highly recommended for indoor painting projects. It dries fast, but takes a long time to cure and retains a relatively ‘soft’ finish—which isn’t ideal for furniture that will be heavily used. One of the big advantages of latex paint for furniture is the wide range of available colors. Choose from the color chips on hand, or have the paint counter mix up a custom shade that will perfectly suit your furniture piece and décor. This level of choice makes it easy to find the paint shade that matches your vision—and your room. Latex paint is also available in multiple finishes. You can choose from flat (matte), satin, semi-gloss, or glossy finishes for your project. Flat: Without any resins in the formula, this type of latex paint won’t reflect much light and will have a matte—almost velvety—appearance. However, it won’t be a very durable finish that can stand up to a lot of bumping, touching, and washing—so save this finish for a project that isn’t going to be under heavy use daily. For a more durable matte paint, you may also consider using chalk paint. Satin: A paint with a satin finish reflects a minimal amount of light (eggshell is a closely related finish). If you like the look of matte paint, but need a paint for furniture that is more durable, then satin paint may be the best choice for you. If you opt for a washable formula, you’ll find it easier to keep clean. Semi-gloss: This might be the best paint finish for furniture, since a semi-gloss paint reflects light well and stands up to washing and the demands of increased use. The greater concentration of resins in a semi-gloss formula make this paint more durable for furniture you actually plan to put to work. Many people like the shiny finish, too. High-gloss: A glossy paint finish will give your pieces the most drama and durability—but demands the most prep. High-gloss paints reflect a lot of light and their increased concentration of resins makes them able to withstand a lot of use and cleaning. But beware—a surface with this much sheen will amplify imperfections. So if you opt for this type of paint for furniture, you’ll need to make sure it’s prepped and ready and any imperfections have been remedied. Know that latex paint is prone to chipping or scratching under heavy use. Instead of soaking into porous surfaces like oil-based paint, latex paint bonds to the surface layer of furniture. As a result, this layer of paint can be damaged relatively easily. For better results, prep the surface with sanding and a primer—and know that you might have touch-ups to do in the future. Best For: Pieces of furniture that won’t see a lot of action and when affordability is a top factor. Reclaiming vintage furniture or giving newer pieces old-world charm has led to a rise in popularity for chalk paint. This water-based paint typically has latex as its base, but delivers a thicker, buildable texture. Chalk paint is available from specialty retailers, though it’s becoming more and more widely available. Some people have even found success making their own chalk paint, but the best and most consistent results come from buying a commercially available formula. It’s more expensive than conventional latex paint, but people love it for its unique look and silky smooth finish. Unlike other more conventional paint for furniture, there can be a bit of a learning curve when first using chalk paint. It dries fast, which is a plus, but also means that brush strokes can be seen if you revisit an area for touch-up once the paint has started to dry. Prepare to practice some, or be flexible in the overall look of the finished product. Chalk painting furniture has become a very popular thing to do, so even the learning process can become an enjoyable and rewarding hobby. Chalk paint can be sanded or distressed to create a weathered look, so the product is popular among people looking for a more "vintage" or "shabby chic" look. Best For: Refinishing antique pieces or achieving a rich, matte look on furniture that you use every day. If you’re looking for a natural paint for furniture with a slightly thinner texture than chalk paint—but plenty of character—then milk paint might be the right type for you. This non-toxic paint is made from milk protein with an activator, typically lime or Borax. Color pigments are added to change the tint of the paint. Milk paint for furniture is popular for its eco-friendly ingredients with no chemicals or added fumes. In fact, this paint has a long history of use for painting furniture, houses, and more before commercial paint was widely available. It can be used on a wide variety of surfaces, but you should know that the finish can vary and sometimes is inconsistent in terms of saturation. To ensure more consistent results (and less chipping, since this is a water-based paint), it’s recommend that you use a bonder with milk paint. This is also important on smooth surfaces like glass or plastic. A unique feature of milk paint is that it’s typically sold in powder form. Add water to mix up the amount of paint you need, and store the rest for later use or touch-ups. It’s typically less expensive than chalk paint, but yields similar results. A top coat of wax or oil may be necessary to preserve the finish. Best For: Furniture that you want to appear antiqued, weathered, or distressed. It’s easy to age the finish of milk paint with light sanding on the corners or edges—or leave it intact for a smooth, matte look. Acrylic paint is another water-based type of paint for furniture that is closely related to latex paint. Color particles are suspended in an acrylic polymer and offer a pop of rich color with a smooth finish. It can be applied to a variety of surfaces, making it a versatile type of paint for furniture, however it’s often sold in smaller containers—making it a better choice for small-scale projects like console tables, picture frames, and other accent pieces. Acrylic paint goes on evenly and is self-leveling, making it easy to work with. However, a primer is a good idea if you want the paint to adhere better to the surface. 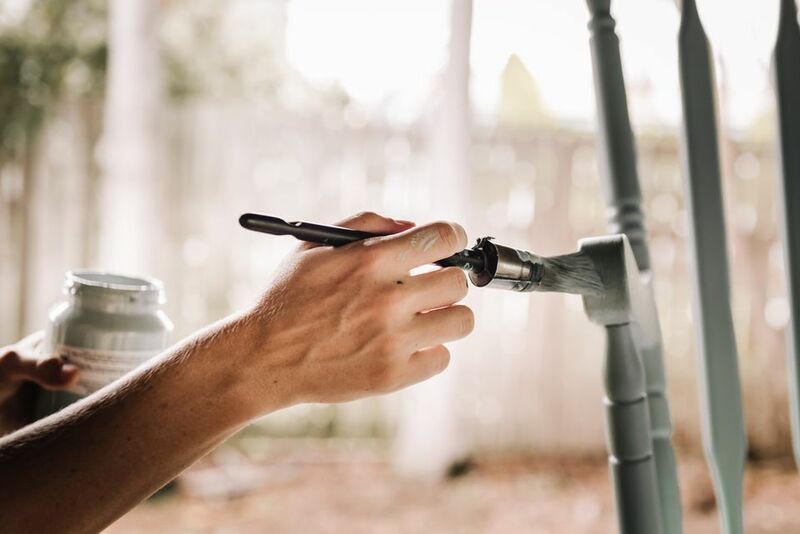 Drying times are short for acrylic paint, so you can apply several coats in a relatively short period of time—but you will need to give it plenty of time to fully cure once the project is complete. Clean-up is also easy with just soap and water, since it’s a water-based paint. It should be noted that acrylic paint does have more elasticity to resist chipping or cracking than some other types of water-based paint, but is still best suited for pieces with light to moderate use. Best For: Small furniture or accent pieces that need a quick, affordable coat of paint. Oil-based paint, also sometimes called alkyd paint, is a durable type of paint for furniture. However, this durability comes at a cost—oil-based paints are usually more expensive, take longer to dry, and have high levels of VOCs that require abundant ventilation. Even still, painting furniture with oil paint is something to consider if you want a resilient finish that won’t chip or scratch easily. You’ll need to have a natural bristle brush and mineral spirits or turpentine on hand as paint thinner and for clean-up. The advantage to oil paint for furniture is that it can be applied over most surfaces and adheres well, since it saturates any porous surface and is self-leveling for easier application. Drying time between coats is long—up to 24 hours—but it does cure more quickly than water-based paints. You might also consider oil-based paint if you don’t know what type of finish is currently on a piece of furniture. While water-based paints will have a tough time adhering to a surface previously painted with oil paint, this type of paint can be applied successfully over either water-based or oil-based paint. However, the VOCs emitted by oil paint during and after the painting process require ventilation and cause concern for some. In fact, some states have banned the sale of oil-based paint altogether. This makes it tougher to find oil-based paint for furniture, since it isn’t widely available in big box home improvement stores. Best For: Any type of furniture that is heavily used and needs a durable finish—but you’ll need to be prepared for the long drying times and fumes that come with this type of paint. Aside from choosing the right type of paint for your furniture project, make sure you choose the right application method. You can select from natural bristle brushes (for oil-based paint), synthetic bristle brushes (for water-based paint), or cloths, rollers, or sponges for specialty applications and effects. The stroke and finish you achieve will vary based on what type of applicator you use. A brush will give you broad coverage but might show strokes more easily (especially with water-based paint). A roller offers less control, but even coverage. Application with a cloth or sponge is best for a unique, textured finish.